Has this ever happened to you? You're strolling through the farmers' market on a balmy August day when you spy a table heavy with heirloom tomatoes. There's a youthful, striped Green Zebra sitting next to a grandfatherly, bulbous Cherokee tomato the color of red wine. You scoop up a couple of each. Your mind is swimming with juicy possibilities -- tomato and mozzarella salad, tomato and goat cheese tart. As you're walking toward the farmer to pay for your tomatoes, you spot a perfectly scalloped white patty pan squash. You've never seen a white squash before, so you select three. Then the farmer points out his captivating purple string beans. You say you'll buy a pound of those too. No one passes up purple string beans. You hand your heavy sacks to the farmer who weighs them and says, "That'll be $28 dollars, please." You blanch. You only have $20 left in your wallet. What do you do? Here's my advice. At this point, excuse yourself. Walk to the nearest ATM or hit your kid up for the money. Whatever you do, buy the vegetables. This is a case where they really are worth the price. When planting kitchen or community gardens for clients Tenenbaum uses almost exclusively heirloom crops. Why? "We love to show people what kind of diversity there is out there. Most people know about heirloom tomatoes, but they might not know that there's also heirloom peppers, eggplant, squash, and melon too. And [the flavor] is not like anything they have had before." Indeed, heirlooms taste the way fruits and vegetables used to taste. That's because heirloom crops are bred primarily for flavor. In contrast, traditional crops are bred for durability -- to withstand cross-country truck drives -- and for uniformity in size, shape, and even flavor. That's why tomatoes and peppers and corn typically look and taste the same in supermarkets across the country. Not only do heirloom varieties taste better, but they also benefit the environment: “I personally love heirlooms because they promote bio-diversity (living ecosystems) which is good for the planet," said Tenenbaum. The day I met Tenenbaum he sent me home with my arms full of heirloom vegetables including Bennings patty pan scallop squash, Hopi purple string beans, watermelon beefsteak tomatoes, and lemon verbena which became today's recipe: Sauteed Patty Pan Squash, String Beans, and Tomatos with Lemon Verbena. 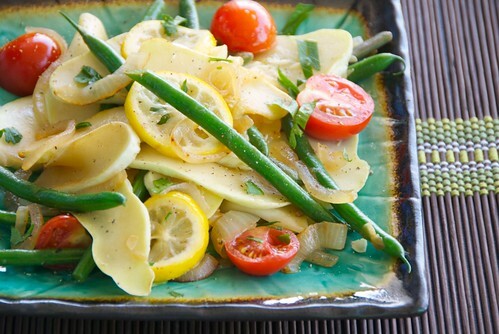 This citrus-spiked vegetable saute is the ideal accompaniment to grilled fish, chicken, or steak on a hot summer night. It's also delicious mixed with quinoa or barley for a satisfying vegetarian meal. If you're still not convinced about paying top dollar for heirloom crops, then consider their fanciful names like "California Wonder" peppers, "Moon and Stars" watermelon, and "Tongues of Fire" beans. I mean, really, who could pass those up? Lemon verbena is an intensely aromatic and flavorful herb that can be found at farmers' markets and some specialty markets. If you can't find it, then you could substitute lemon basil, or use extra lemon zest mixed with parsley or basil. For different herbal flavors, try rosemary, cilantro or fresh oregano. 1. Warm olive oil in a large skillet or wok over medium-high heat. Add onion and saute 3-4 minutes, or until softened and translucent. Add squash and cook 3-4 minutes, or until lightly browned and softened. Add string beans and cook 3 minutes until just softened. Add tomatoes and cook 2 minutes until wilted. Add remaining ingredients, tossing well until warmed through. The vegetables should be cooked through yet still firm, not mushy. Remove from heat. Serve hot or at room temperature. I don't love vegetables, but I just bought a big basket of heirlooms yesterday. Had some last night with basil and sea salt and cherry vinegar... they were divine! I love heirlooms, there is nothing that tastes better. A great post! I'm in total agreement with you Susan! I'd rather eat veggies and fruits that taste like veggies and fruits (and pay a bit more for it) than pay less and feel like I'm eating air. jessica-Don't you just love their intense flavor? Cherry vinegar? I have never had that. I'll have to look for it. joanne-I know, especially when it comes to tomatoes. Supermarket tomatoes are so flavorless. I'm lucky that my CSA delivers heirloom varieties every week. I can absolutely taste the difference. If taste wasn't enough, the colorful names are fascinating! I'm saving this recipe for the next harvest of patty pan squash! I love love love heirlooms! I just bought a big box of them at my farmers market this past weekend and then proceeded to run out of money before I could scoop up the rest of the goodies I needed! They were delicious to say the least - and totally worth every penny! That's a beautiful, beautiful salad. I swear I could almost become a vegetarian! I totally agree. The taste of these vegetables speak for themselves. I was happy as can be to find some Hopi purple string beans at my farmers market this weekend! i've never cooked with patty pan squash before. don't they have a tough skin? do they need to be peeled for cooking? I can never resist green zebra tomatoes! When I see those great heirloom varieties, I always wish I could grown them myself. They are all worth the price to support our local farmers, plus everything seems to taste that mich better! My favorite heirloom find was pink potatoes. And if taste isn't enough - you can save the seeds! Don't you just love planting what you eat? I'm hoping to grow some late harvest heirloom veggies from a few seeds I've collected at this years' farmers market tables. Gotta love those over-ripe, juicy tomatoes! Oh, almost forget. I just couldn't resist. Such pretty lemons in these photos. Anyone know where you can find about 10 tons of sweet Meyer lemons? This is so beautiful! I love heirloom tomatoes and just made a salad with them yesterday. There is something so romantically gorgeous about the various colors and patterns- they are all so unique. Great post! This is the second year I've grown heirloom tomato varieties, and it has been rather hit or miss. Some are better than others, some fail completely in our climate/soil, etc. but largely, I feel it has been worth the effort-even with smaller yields. Even the less than wonderful tomatoes I've grown are better than what finds the way to the supermarket. Where I grew up, Summer brought the tiniest versions of patty pan squash-no larger than a quarter, and they were often white or green. Locally, we called them "asparagus squash" though I have no idea why-they don't taste anything like asparagus. Then, they seemed to disappear-I didn't see them for something like 20 years. Slowly, they are starting to show up at farmer's markets again, which is awfully nice. As horrible as this summer has been for us weather wise, I really will be sorry to see all the wonderful vegetables go. How can you pass on the heirlooms? I am going to hate it when summer is over. This year I grew every variety of heirloom tomatoes I could - and they are incredible! My favorites are the ugliest ones on my bushes - the Cherokee purple. One ugly tomato with the most incredible flavor!! Am spreading the word to everyone I know - buy or grow heirlooms! I was just given a bushel of heirlooms (froma farmer at farmer's market). It was a batch she couldn't sell for bruises. The first dish I made was bruschetta and it knocked the socks off my company. I've been in that position of running out of money at farmer's market and having sticker shock, but I do my best to support them. Hi everybody! Thanks for your thoughtful comments. I see you agree that once you taste heirloom varieties, it's hard to go back. And I love that so many of you are growing your own. I wish I could too, but that's a downside of vertical living. I hope your gardens continue to bloom!